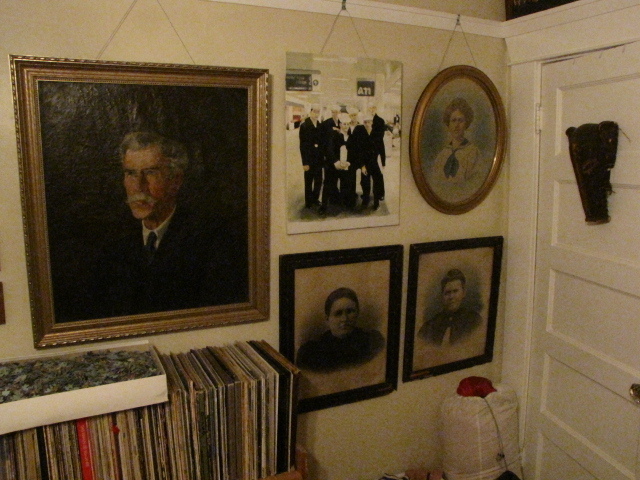 Western wall, featuring a proper view of Great-Great-Grandfather Enright, A painting of sailors by R.Handley, and three ladies I purchased from the Walnut Creek thrift store, an Oakland thrift store, and the 2004 Bernal Heights Hillwide Sale (clockwise from upper right). Also pictured: a box of puzzle pieces, roughly half of my "good record" collection, a down sleeping bag, fringes of my laundry, and the African mask given to me on late 80's/early 90's Christmas by my Navy uncle. It's cursed, they say, but that's another story. The door leads to my closet. Vollmann's Rising Up and Rising Down (purchased on ebay after many months of waiting for a reasonable used price, still have yet to start on the 2nd volume), a plastic death's head cup (gifted on the occasion of my 26th birthday by A.Tith, also cursed), turkish coffee cups (gifted by my mother, originally from her grandmother), more turkish coffee cups (also gifted by my mother, found by her in a junk shop, now containing an assortment of fountain pens and pen knife), scraps of fabric, and a jewelery box resting on my four drawer dresser. 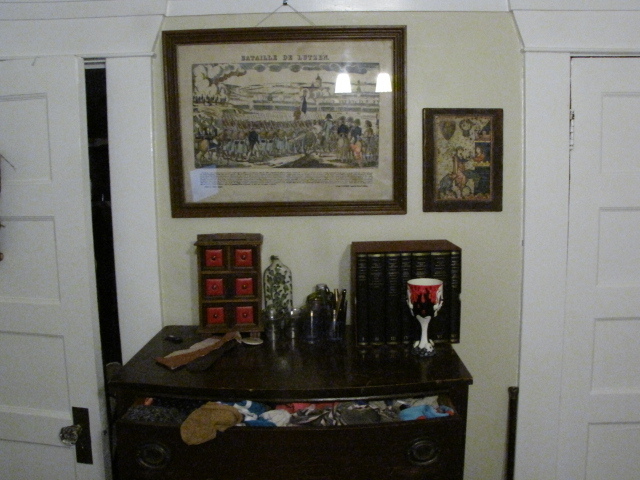 The dresser was purchased from the Oakland thrift store and contains undergarments, pants, and shirts. It's in pretty poor repair, but a decent style. The jewelery box contains my various cuff-links, pins (including my Inamorati Anonymous badge), and knick-knacks. Two pictures. 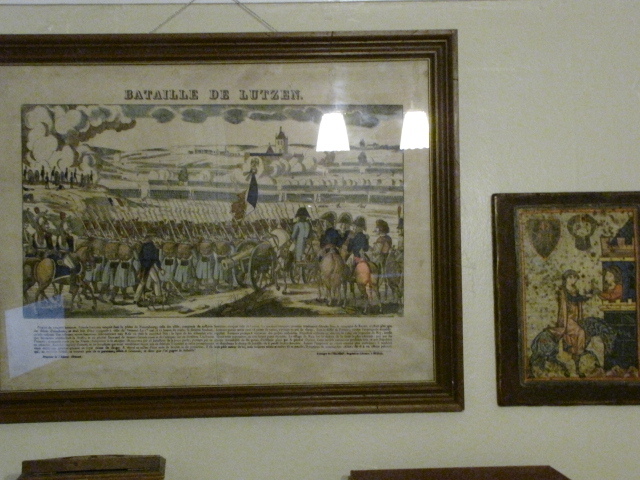 The "Bataille de Lutzen" print was purchased at the recent White Elephant Sale for a sum I'd care not to disclose. It's a pretty stellar print, though. 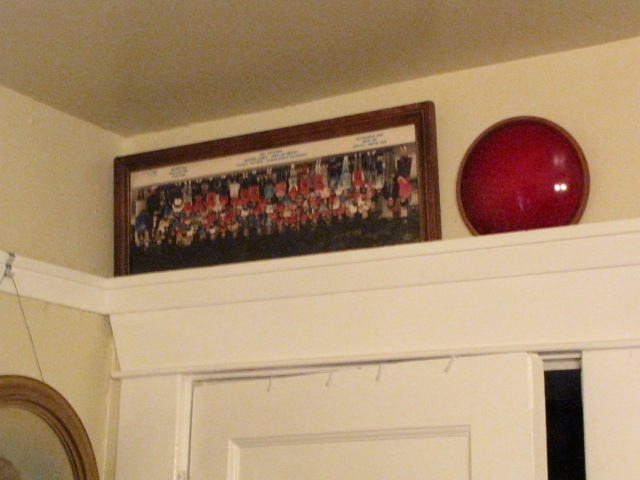 Nice frame, too. The second print, mounted on wood, depicts some religious scene or other... Unsure of the exact content, but seems Russian, perhaps? It's spotted with mold, which only adds to the charm. Purchased from a flea market several years ago. Jealous of the Vollmann. RE: 2666; I remember you mentioned to me some months ago you had picked it up; they just found what might be the last section among Bolano's manuscripts, so there may be more. I the one that's packaged as three books a week or so ago and am looking forward to reading it when I finishing doing my time with Shakespeare.